As I posted a beautiful poem at BeautyStartsWithMe.com, I wondered at it’s wisdom. (Read the poem here). In fact, the advice is precisely what I needed to read today. You see, I’ve been deleting toxic people from my life. One of my mottos has always been to delete that which is unhealthy for me or my children, no matter what. I have learned the difference between genetic ‘family’ and true family. As I consciously surround myself with joy and walk away from baseless hatred, judgment, greed, and drama, I affirm that blood is NOT thicker than water. Friendship endures when all involved feel safe to honestly discuss issues of importance to each other. Friends don’t always agree with each other. Friends don’t hide things from each other. Friends DO always have each other’s best interest at heart. So how do I love freely without subjecting myself to hurtful situations? I choose to love those I have deleted from my life from a safe distance. To me, that means to send them joy, light, peace, and health even while knowing that they will never be a part of my life again. To love with reckless abandon MUST begin with self-love. I love myself enough to walk away from those that hate me, for they don’t really KNOW me. I love myself enough to speak my truth. I love myself enough to surround myself with joy. I acknowledge that life is so much happier and stress free when I’m not surrounded by toxic people or the associated social expectations. Love YOURSELF first. Always love unconditionally. By knowing that I love unconditionally, even when those I have loved turn their backs on me, I easily achieve a state of calm and grace. I create my family by surrounding myself with those who are honest and loving and authentic. The rest of them, I call distant cousins. 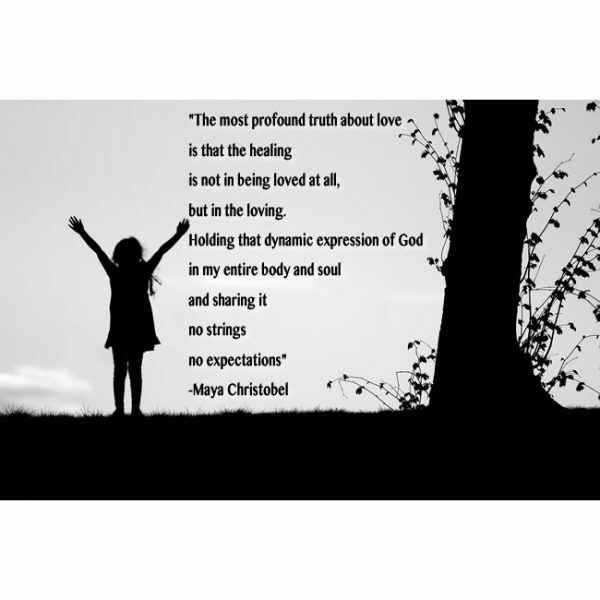 Sometimes, it’s the “…or not” in the following excerpt from Maya Christobel‘s poem, Whole-Heart that stands out.